Of the more than four million Italians who left home between 1880 and 1920 with dreams of a better life, nobody could have imagined their children fulfilling the American dream by playing a game that was as foreign to them as the English language. Examining the experiences of baseball pioneers, current players and coaches, fans, and historians, filmmaker Roberto Angotti captures the story of how Italian Americans assimilated into popular culture through America’s favorite pastime in his new hour-long Italian American Baseball Family documentary. The film also explores how Italian Americans have circled back to Italy to help grow the game abroad by playing for Team Italy in the Olympics and the World Baseball Classic. Although brothers Vince, Joe, and Dom DiMaggio may be the premier Italian American Baseball Family, the Colabellos from Milford, Massachusetts are a perfect example of the modern day Italian American Baseball Family. Father Lou Colabello was the starting pitcher for Team Italy against host Team USA at Dodger Stadium in Los Angeles during the 1984 Olympics while his son Chris Colabello later played baseball in Italy as a youth and, like his father, eventually went on to represent Team Italy in the 2013 and 2017 World Baseball Classics. The Italian American Baseball Family traverses the U.S. cultural landscape and documents an ethnic group’s rise from adversity by celebrating its triumphs in breaking into a sport originally dominated by English, Irish and German immigrants. The 2017 Russo Brothers Italian American Film Forum Award-winning movie showcases both the hardships and accomplishments of legendary Italian American baseball players. While on the Russo Brothers Italian American Film Forum panel discussion at the NIAF 42nd Anniversary Gala in Washington, D.C. on November 4, 2017, Roberto Angotti spoke about his new documentary (Photo by Andy Del Giudice). After Japan bombed Pearl Harbor on December 7, 1941, the United States declared war and began targeting those of German, Italian, or Japanese descent. The Italians were the largest immigrant group in the U.S. at the time and about 600,000 of the country’s five million Italian immigrants who had not yet naturalized were forced to register as enemy aliens. Baseball came ashore to Italy in 1944 when allied soldiers stormed the beaches of Nettuno and nearby Anzio en route to freeing Rome from its Nazi occupiers. American troops brought baseball gear and taught Italians how to play. Baseball countered the negative immigrant identity as an outsider. The game bridged the gap so that Italians could integrate into the American way of life. The Italian American Baseball Family brings home the message that baseball allowed Italian Americans to assimilate into popular culture. The documentary honors the Italian American baseball ambassadors who have etched their names into U.S. sports history. The film pays tribute to their invaluable contributions and acknowledges those players who have left their unique imprint on the game. Filmmaker Roberto Angotti and baseball historian Professor Lawrence Baldassaro with the Russo Brothers Italian American Film Forum Award at the NIAF 42nd Anniversary Gala in Washington, D.C. on November 4, 2017. Roberto was fascinated by the game of baseball since he was a child and played Little League. He witnessed Tommy Lasorda lead the Los Angeles Dodgers to two World Series titles in the 1980s. In high school, he played American Legion baseball. As a Film Studies student at Claremont McKenna College (CMC), Angotti did play-by-play broadcasts for Pomona-Pitzer Baseball while program director at KSPC 88.7 FM. His education at CMC was the foundation for him to catapult into the entertainment industry. Roberto was recently the subject of a CMC alumni profile. To access the article, click on this link: https://www.cmc.edu/news/filmmaker-roberto-angotti-traces-roots-of-italian-american-baseball. Throughout his professional radio career at KNAC 105.5 FM (Long Beach), KROQ 106.7 FM (Pasadena/Los Angeles) as well as 91X and 92.5 FM (San Diego), he integrated music, sports, and popular culture to become one of the most listened to on-air personalities in Southern California. Director of Photography Peter McEvilley accompanied filmmaker Roberto Angotti, who received the Russo Brothers Italian American Film Forum Award at the NIAF 42nd Anniversary Gala in Washington, D.C. on November 4, 2017. In 2011 Angotti launched an MLB.com blog which eventually became a Top 10 MLB.com Fan website – www.MLBforLife.com – to showcase up-and-coming Italian and Italian American players. 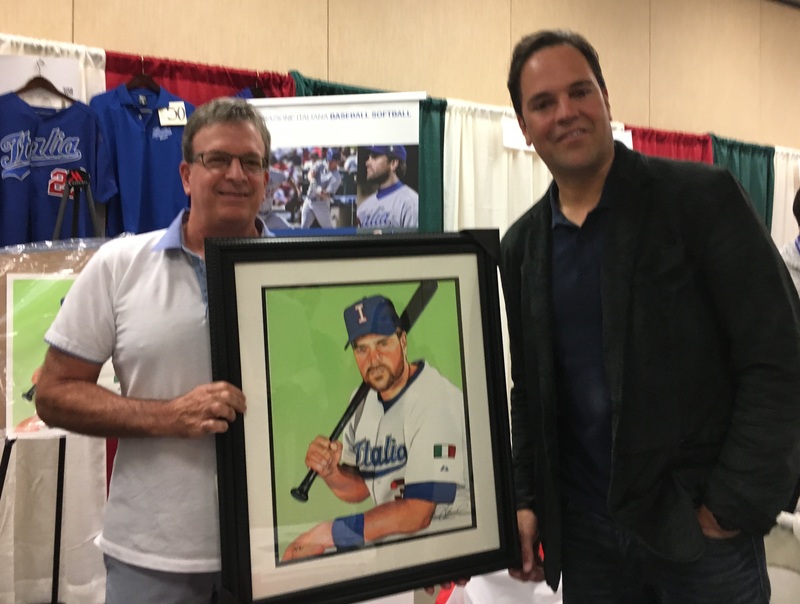 After visiting the Italian Baseball Academy near Pisa, Roberto was invited to the 2013 World Baseball Classic in Phoenix, Arizona, where he got to know Mike Piazza, who served as hitting coach for Team Italy. Piazza inspired him to document the Italian American experience. That same year Angotti curated the Artists’ Tribute to Italian Americans in Baseball exhibition at the Convivio Center in San Diego’s Little Italy. The exhibit featured Italian American artists who focused their work on Italian American Baseball Hall of Famers: Tony Lazzeri, Joe DiMaggio, Roy Campanella, Yogi Berra, Ernie Lombardi, Phil Rizzuto, Tommy Lasorda, Ron Santo, Joe Torre, Tony La Russa, John Smoltz, Craig Biggio, and Mike Piazza. 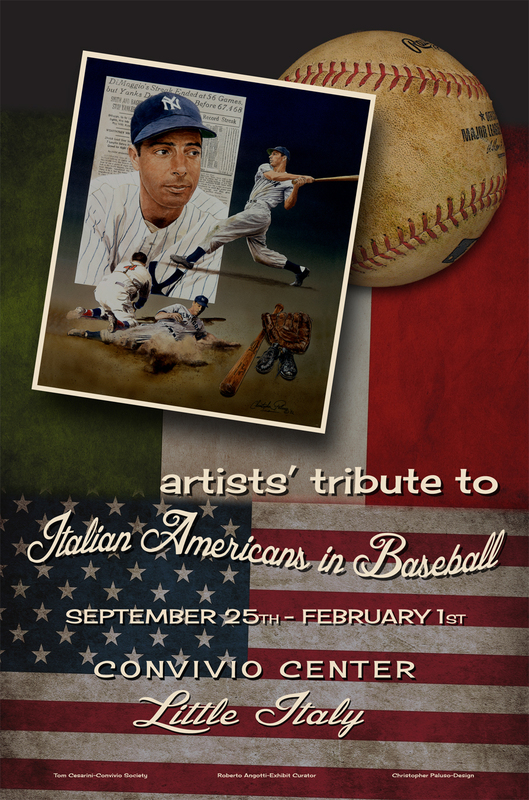 Filmmaker Roberto Angotti was also the curator of the Artists’ Tribute to Italian Americans in Baseball Exhibition from September 25, 2013 to February 1, 2014 at the Convivio Center in San Diego’s Little Italy (Design by Christopher Paluso). As the English language editor and reporter for Federazione Italiana Baseball Softball (www.fibs.it/en), Angotti represented the Italian national teams at three international competitions in 2017: the World Baseball Classic in Guadalajara, Jalisco, Mexico; the World Baseball Softball Confederation (WBSC) U-19 Junior Women’s World Championship in Clearwater, Florida; and the WBSC U-18 Baseball World Cup in Thunder Bay, Ontario, Canada. 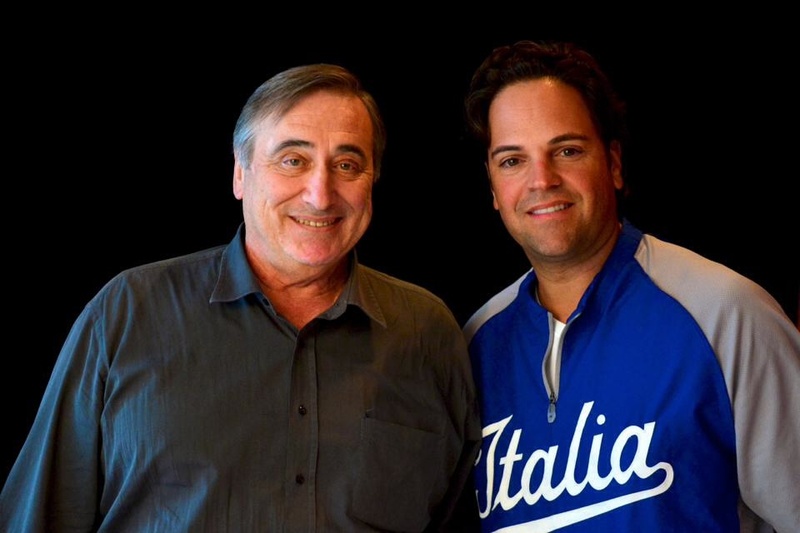 When Roberto returned from the 2017 World Baseball Classic, he resolved to make a film about Italian Americans and their integral role in baseball. The National Italian American Foundation (NIAF), the Italian Sons and Daughters of America, and the Russo Brothers offered the Italian American Film Forum Grant to filmmakers wanting to share the Italian American experience. It was a natural fit so Angotti applied and was chosen as one of seven grant recipients. Later he was selected as one of three finalists invited to the 42nd Anniversary NIAF Gala Weekend in Washington, D.C., where he was proclaimed the winner and presented the Russo Brothers Italian American Film Forum Award by Italian Sons and Daughters of America President Basil Russo, National Italian American Foundation President John Viola and FOX Business Network TV Anchor/Global Markets Editor Maria Bartiromo on Saturday, November 4, 2017. The writing is on the wall just as it was in 2012 when former UC Davis Aggie pitcher Marco Grifantini and catcher Tyler LaTorre helped Team Italia capture its second consecutive European Baseball Championship by defeating a talented Kingdom of the Netherlands squad and again in 2013 when both California natives played in the World Baseball Classic. With the 2017 World Baseball Classic around the corner, two additional UC Davis alums–Toronto Blue Jays reliever Joe Biagini and free agent infielder Daniel Descalso–could potentially give manager Marco Mazzieri a boost if the Italian American players are added to the Team Italia roster. One could make a strong case for Biagini’s participation should fellow Jays bullpen paisan Jason Grilli be playing in his fourth consecutive World Baseball Classic for Team Italia. Joseph Carlo Biagini‘s Italian family bloodlines run deep with relatives in Lucca. His Italian great uncle, Carlo Biagini, was a merchant marine there. Joe’s father, Rob Biagini–who spent time playing ball in the Giants organization from 1981 to 1982–also played abroad in Italy with former teammate Chris Colabello’s father, Lou Colabello. However, it might take an executive order from new Canadian-born Federazione Italiana Baseball Softball (FIBS) president Andrea Marcon to get Biagini onboard with Team Italia in the 2017 World Baseball Classic. After redshirting and playing one year at the College of San Mateo, right-handed pitcher Joe Biagini transferred to UC Davis, where he made 13 appearances out of the Aggies bullpen and went 3-1. He was selected by the San Francisco Giants in the 26th round of the 2011 MLB draft after his redshirt sophomore season. On December 10, 2015, Biagini was taken by the Toronto Blue Jays from the San Francisco Giants in the 2015 Rule 5 draft. On April 8, 2016, Joe made his MLB debut when he pitched a perfect ninth inning against the Boston Red Sox and posted his first career strikeout facing David Ortiz. In his six appearances during the 2016 postseason against Baltimore, Texas and Cleveland, Biagini threw 7.1 scoreless innings with six strikeouts. He was the unanimous choice for rookie of the year at the recent annual Blue Jays player awards. The 26-year-old reliever was the only Jays rookie to go wire-to-wire with the team, a major accomplishment for a Rule 5 draftee. Starting out the season as a middle-relief fixture for manager John Gibbons, Joe gained the trust of the veteran skipper who later assigned him to late-inning duty. Biagini has since been the center of attention in the media as a result of being in the audience at a taping of The Tonight Show Starring Jimmy Fallon. During the show, Fallon passed Biagini in the audience and attempted to high-five him along with other audience members, but the popular celebrity TV host missed Biagini’s hand. During the November 18th episode, Fallon stated that he had taken criticism on Twitter for botching the high-five and brought Biagini out on stage briefly to complete their high-five. Daniel Descalso was drafted by the St. Louis Cardinals in the third round of the 2007 MLB draft following his junior season at UC Davis. Descalso made his MLB debut with the Cardinals on September 20, 2010. Despite the 30-year-old Italian American utility man only having a .242 career average, Descalso is much more important on the field as he has played every position but catcher and center field. After five successful seasons–including a 2011 World Series title–in St. Louis, Descalso signed with the Colorado Rockies on December 16, 2014. Rockies manager Walt Weiss recently said, “Daniel has a great pedigree, he’s played in the postseason, played in the World Series. And that goes a long way in that clubhouse. Guys understand how hard it is to get there. He’s a winning player, he’s got a winning attitude, he’s a leader… so, his value goes way beyond the stat sheet.” When asked if Descalso might make a good coach or manager in the future, Weiss replied: “Yeah, absolutely. I think he’s definitely cut from that mold. He’s one of those guys that has obviously been a student of the game. He’s a smart player. He played at a small school, UC Davis, and has probably always had to prove himself and overachieve to some degree but he’s put together a nice Major League career.” Descalso was the second UC Davis Aggie player to ever reach MLB in 2010 and the first to win a World Series ring in 2011. Before becoming the Aggies’ second-highest MLB draft pick, Daniel hit a team-best .397 as a junior in 2007, with 22 doubles, three triples, four home runs, 53 runs scored and 44 RBI. With infielder Nick Punto now retired and serving as the Team Italia third base coach, the versatile Daniel Descalso could prove to be a valuable defensive replacement and offensive spark plug in the World Baseball Classic. For the past two years, Tyler LaTorre has been working as an assistant baseball coach at San Francisco State University under head coach Tony Schifano–who spent eight years as the assistant coach at UC Davis, his alma mater. Like Schifano, LaTorre is a former Aggies all-star. Tyler played at UC Davis from 2003-06, earning all-conference honors as a senior when he hit a team-high and career-best .363 with 37 runs and 32 RBI. He drew a team-best 28 walks and led the Aggies with a .451 on-base percentage. LaTorre was signed as an undrafted free agent by the San Francisco Giants on May 29, 2006 after a five-year UC Davis career. The former catcher played 10 seasons in the minor leagues–including nine of them in the San Francisco Giants organization–when he caught the likes of Madison Bumgarner, Matt Cain and Ryan Vogelsong before signing a minor league contract with the Milwaukee Brewers in 2015. During his pro ball career, LaTorre played a total of 452 minor league games during which he posted a .241 career average with 60 doubles, 14 home runs, 131 RBI and 155 runs scored. Yet, some of Tyler’s most memorable games included his time playing for Team Italia in the 2012 European Baseball Championship when he nearly won MVP tourney honors after going 14-for-28. Eight of his 14 hits were for extra bases–including six doubles and two home runs. LaTorre absolutely raked at the plate, knocking in nine RBI and scoring nine times during the international tournament. “We had one goal and that was to repeat as European champions,” said LaTorre. “It was awesome.” He also enjoyed serving as backup for Team Italia catcher Drew Butera in the 2013 World Baseball Classic. The 33-year-old Italian American started against Team USA and went 1-for-4 with a walk and one run scored. LaTorre’s Italian roots trace back to his great-grandparents in Italy. It took two and a half years for him to become eligible to play for Team Italia as a dual citizen and Italian passport holder after thorough research, documentation and tedious paperwork authenticating his Italian lineage. Team Italia reliever Marco Grifantini pitching in the 2013 World Baseball Classic. An elated Marco Grifantini signed a minor league contract with the Blue Jays in 2013. 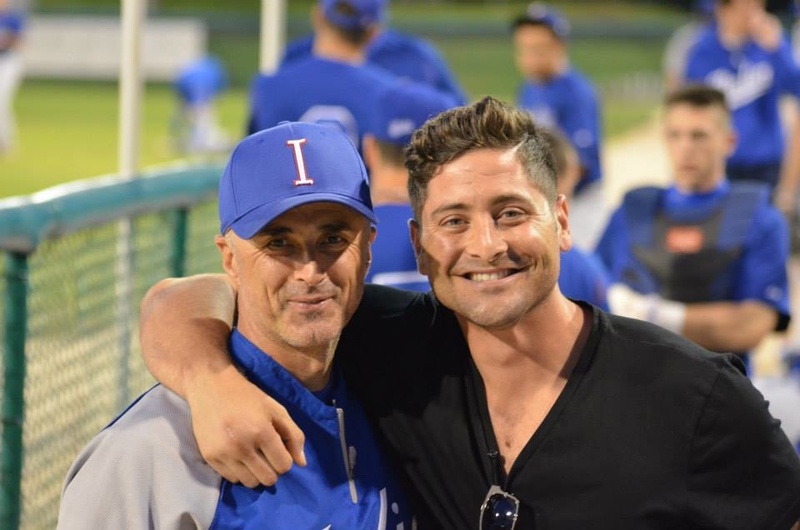 The Italian American Baseball Family is on a mission to strengthen Team Italia and its fan base. In late 1976 Lou Colabello got an invitation he could not refuse from friend Ed Orizzi, who was looking for a pitcher to help Rimini compete in the Italian Baseball League. It didn’t take long for the left-handed ace from the University of Massachusetts Amherst to regain his pitching form last seen in the 1969 College World Series to lead Rimini to three Italian Series A titles from 1977 to 1984. Putting together a stellar 94-25 record with a 2.99 ERA, the owners of the other IBL teams did not want to see Colabello’s dominance any longer. As a result, the president of the league and owner of the team in Parma implemented a rule that barred American-schooled Italians over the age of 26 from pitching. Italian American Lou Colabello pitched for Team Italia against USA at Dodger Stadium in the 1984 Olympics. After meeting the love of his life Silvana in Rimini and getting married to her in 1981, the Italian American Baseball Family Tree grew its first branch with the birth of their son Chris Colabello in 1983. Lou was invited to play for the Italian national team in 1984, when he would pitch against USA’s Barry Larkin, Will Clark, Shane Mack, Oddibe McDowell, Mark McGwire, Cory Snyder and B.J. Surhoff at the 1984 Summer Olympics in Los Angeles. Fast forward to the first pitch of the 2013 World Baseball Classic warm-up game between Team Italia and the Los Angeles Angels. Halos skipper Mike Scioscia looked out at the sea of Azzurri jerseys and said, “I’m proud to be Italian, and I think everyone on that field is proud of their roots and where they come from.” Then Scioscia asked, “Where’s Sal?” He wanted to know where Sal Varriale was. Sal was the first “oriundo” or immigrant with Italian ancestry recruited by Aldo Notari, the former Italian Baseball Federation President from 1985 to 2000. The Brooklyn native enjoyed a successful playing career in Italy and coached Team Italia in the Olympics from 1992 to 2004. Sal Varriale (left) was given the Meritorious Service Award and Mike Scioscia (right) was given the Rawlings Honor Award by the American Baseball Coaches Association at the 2012 ABCA Convention. Today Sal proudly serves as Director of Parma Baseball and as an international scout for the Cincinnati Reds. The Italian American Baseball Family Roots grew during Notari’s tenure governing the Italian Baseball Federation and it continues to prosper with the addition of MLB’s World Baseball Classic under new president Andrea Marcon. 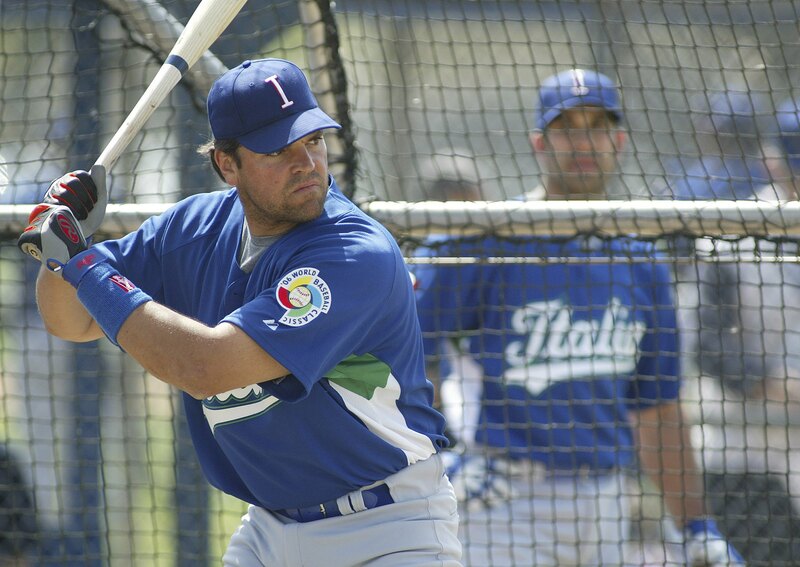 Mike Piazza was recruited by former president Riccardo Fraccari to join Team Italia while visiting Italy in 2002. Jason Grilli and Frank Catalanotto also signed up to play for Team Italia in the 2006 WBC. After playing in the 2006 World Baseball Classic, Hall of Famer Mike Piazza became Team Italia’s hitting coach. With Mike Piazza signing on as Team Italia hitting coach for the 2009 World Baseball Classic in Toronto, many notable Italian American MLB players contributed to Team Italia’s surprise 6-2 upset over host Canada. Chris Denorfia went 4-for-4 with three doubles, two runs, two RBI and played great defense. Starting pitcher Dan Serafini picked up the win after middle reliever Chris Cooper kept hitters off balance and closer Jason Grilli secured the 3 1/3 inning save. 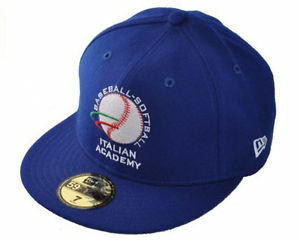 New Italian American Baseball Family members included Nick Punto, Francisco Cervelli, Adam Ottavino, and Mike Costanzo. Chris Colabello and Anthony Rizzo celebrate Italian style after Colabello’s three-run homer against the Dominican Republic in the 2013 World Baseball Classic. After Team Italia defeated Mexico and Canada to advance to the second-round of the 2013 World Baseball Classic, they would suffer a 5-4 loss to eventual 2013 WBC Champion Dominican Republic and demonstrate how its mixed roster of Italian-born players like Alex Liddi and Alessandro Maestri and Italian American MLB-affiliated newcomers Anthony Rizzo, Chris Colabello, Drew Butera and Pat Venditte could compete with international baseball’s elite. 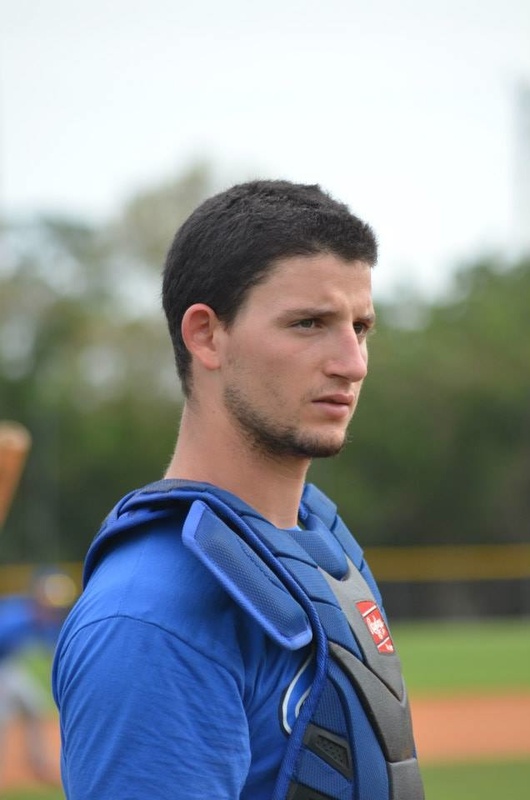 Chicago Cubs catching prospect Alberto Mineo was signed in 2010. Los Angeles radio deejay and journalist Roberto Angotti could see the writing on the wall and knew something special was happening when he was invited to the Italian Baseball Academy in Tirrenia while visiting family nearby in 2012. Since the day Federazione Italiana Baseball Softball (FIBS) Academy director and Chicago Cubs scout Bill Holmberg signed Italian Baseball Academy graduate Alberto Mineo to the Cubbies in 2010, MLB scouts have scattered around the FIBS-sponsored Baseball Academy like flies hunting down the scent of the next big European prospect. Germany’s most successful player to date–Max Kepler, a product of a similar European Baseball Academy that MLB’s Bill Holmberg frequents in Regensburg and recipient of the Minnesota Twins’ $800,000 signing bonus in 2009, proved to be worth his weight in gold based on his 17 homers and 63 RBI during the 2016 MLB season. 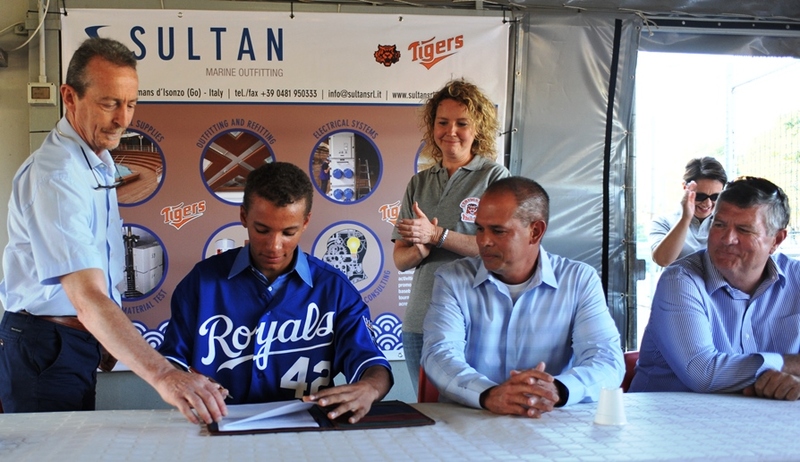 Italian MLB Academy Director Bill Holmberg (far right) smiles as prospect Marten Gasparini signs a pro baseball contract with the Kansas City Royals in 2013. San Remo native Alex Liddi, who signed to the Seattle Mariners in 2005 and made his MLB debut in 2011, was inspirational for young Italian ballplayers like Marten Gasparini who dreamed of playing in the Big Leagues. Heralded as the best 5-tool player ever out of Europe, FIBS Academy graduate and MLB prospect Marten Gasparini received a $1.3 million dollar signing bonus from the Kansas City Royals in 2013. The 19-year-old shortstop credits Italian Baseball Academy director and Team Italia coach Bill Holmberg for his success. 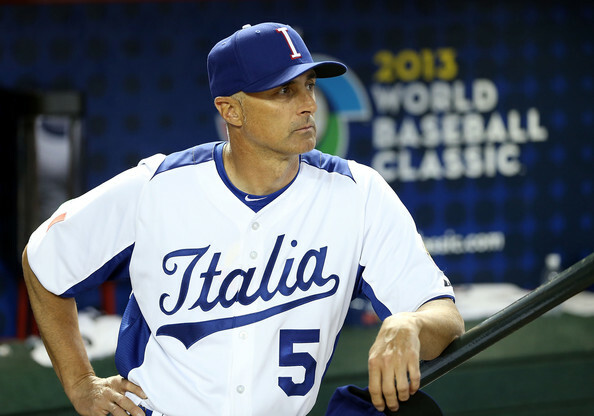 Manager Marco Mazzieri led underdog Team Italia to the second round of the 2013 World Baseball Classic. Team Italia manager Marco Mazzieri has been synonymous with Italian baseball since his playing days in the 1980’s. During his ten-year tenure as the leader of the Team Italia coaching staff, Mazzieri has made the Italians proud with European Baseball Championship titles in 2010 and 2012. The LA Dodgers recruited Mazzieri to become their scout in 2013. Mazzieri went right to work and wasted no time in signing FIBS Academy graduates Federico Celli and Federico Giordani. Growing up in Los Angeles as a first generation Italian American Dodgers fan, Roberto Angotti understood the strong connection between Tommy Lasorda and Mike Piazza. From the moment Piazza decided to play for Team Italia in the 2006 WBC, Angotti enlisted to become a soldier on the frontline of the Italian baseball revolution. Roberto became friends with Mike during the two weeks Team Italia spent in Phoenix preparing for the 2013 WBC. When Hall of Famer Tommy Lasorda dropped in on Team Italia’s practice at Dodgers’ Spring Training Camp in Glendale to address the team, Angotti pledged his support and worked tirelessy behind-the-scenes to provide daily journals of the team’s activities. Lasorda’s emotionally-driven speech coupled with Piazza’s serious commitment inspired Angotti to share the experience with others through a traveling exhibit paying tribute to Italian American baseball entitled Artists’ Tribute to Italian Americans in Baseball. The exhibition featured sports artists of Italian descent–including James Fiorentino–and paid homage to Team Italia. Featured in the New York Times as well as on ESPN, MSG, and FOX, James Fiorentino is considered one of the world’s best sports artists. 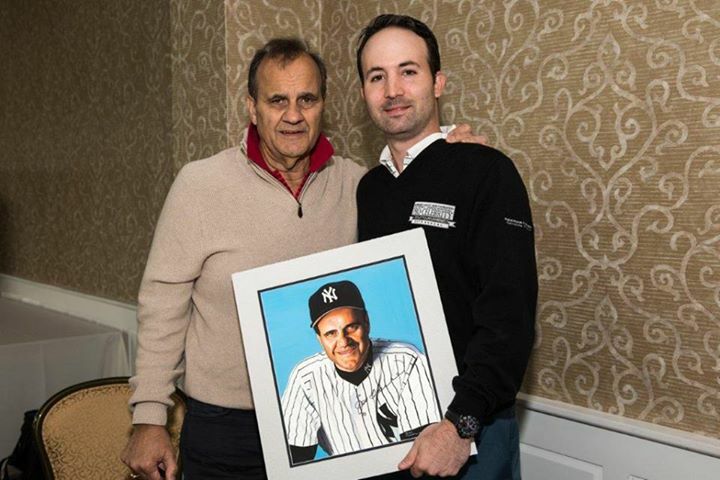 Fiorentino became the youngest artist to ever be featured in the National Baseball Hall of Fame at age 15 with his portrait of Reggie Jackson. Art seen at JamesFiorentino.com grace the walls of the National Basketball and Cycling Hall of Fames, Ted Williams and Roberto Clemente Museums, National Art Museum of Sport and the Sports Museum of America. Italian American Baseball Family’s Joe Quagliano presents Mike Piazza a portrait commemorating his induction to the National Baseball of Hall of Fame by world-renowed artist James Fiorentino. The Italian American Baseball Family grew organically when Mint Pros founder Joe Quagliano reached out to Team Italia manager Marco Mazzieri and offered his expertise as a pro sports event promoter to raise funds for baseball development in Italy. With the support of FIBS executives Riccardo Fraccari, Marinella Mojoli, Massimo Fochi, Marco Landi and Riccardo Schiroli, Quagliano represented the Italian Baseball Federation with Marco Mazzieri at the National Italian American Foundation 41st Anniversary Gala and joined Mike Piazza at the National Italian American Sports Hall of Fame 39th Annual Induction & Awards Gala. The first annual IBAF/FIBS fundraising event sold out in no time upon its initial announcement. The Italian American Baseball Family’s mission includes providing scholarships for athletes at FIBS Academy, a residential program in Italy. Joe Quagliano, James Fiorentino and Roberto Angotti have teamed up for the Italian American Baseball Family Launch and Dinner, the first of many fundraisers to assist in the development of youth baseball in Italy by building and maintaining ball fields, purchasing uniforms and equipment, organizing clinics and supporting FIBS. Like branches on a tree, we grow in different directions yet our Italian family roots remain the same. After two consecutive European Baseball Championship titles in 2010 and 2012, Italia placed second after a heartbreaking 6-3 loss to 2014 Euro Champion the Netherlands. 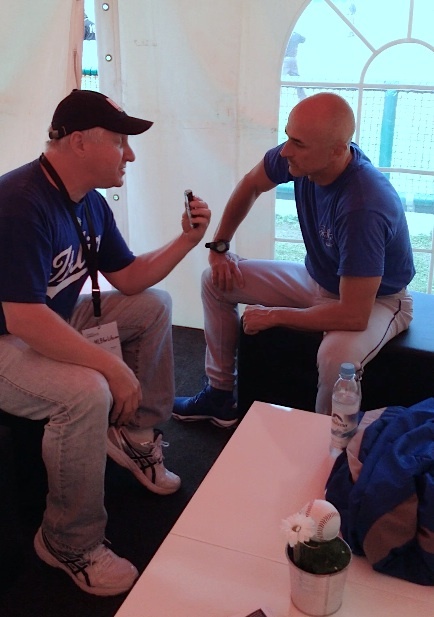 Roberto Angotti interviews Team Italia manager Marco Mazzieri at the 2014 Euro Baseball Championship (Photo courtesy of IandI-GoPro.com). Roberto: It’s a pleasure seeing you again after over a year. It’s quite an honor to be with you at the 2014 European Baseball Championship. Thank you for taking time out to talk. Marco Mazzieri: Thank you. We enjoyed our last experience in the World Baseball Classic with you so that’s why it was no problem doing this. Roberto: Did you feel confident or did you have butterflies in your stomach when you faced your strongest opponent, the Netherlands, for the 2014 Euro Baseball Championship? Marco Mazzieri: Well I think you always have butterflies in your stomach when you face competition like this and most of all when you wear the Italia jersey on your chest. With that being said, we knew it was going to be a very, very tough European Championship because all the teams got a lot better than in the past. We knew that this bracket was going to be tough so we came prepared. With good preparation after 10 days in Verona, where we played Italian Baseball Week against Spain and the Czech Republic, we are very happy with the guys we put together even though we are playing with younger players than in the past. As you can probably see, we have a lot of our products of our Italian Baseball Academy on this team. 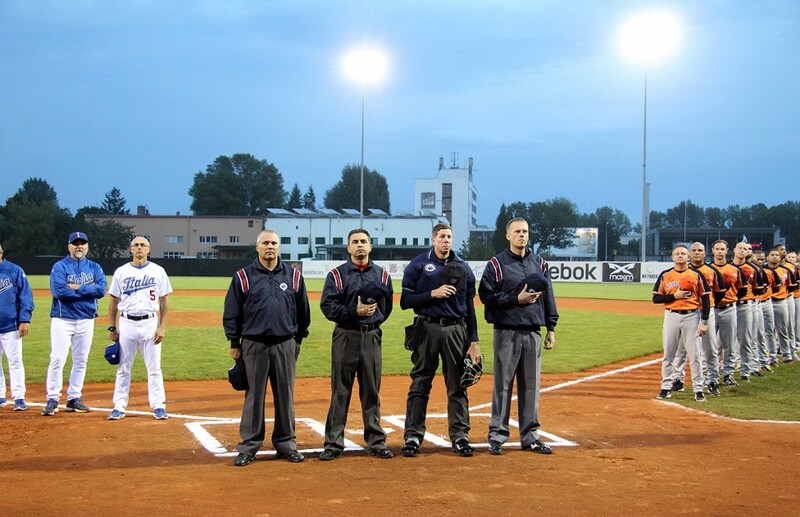 held at Draci Ballpark in Brno, Czech Republic (Photo courtesy of Mister-Baseball.com). Most of Team Italia’s young players are graduates of the Italian Baseball Academy in Tirrenia, which is under the watchful eye of MLB director Bill Holmberg. Roberto: And you are very proud of all of them after they have spent so much time under your guidance and that of Italian Baseball Academy director Bill Holmberg. Considering these players are a work-in-progress, it must be rewarding to see them perform in pressure situations. Marco Mazzieri: I believe a player is never a finished product, so for these kids to be here is a tremendous experience. Hopefully they will pick it up a couple notches. They need to start walking with their own feet now. By playing competitive games, it will help them get to the next level. Bill Holmberg, Team Italia pitching coach and Italian Academy MLB director, visits with Roberto Angotti in the dugout (Photo courtesy of IandI-GoPro.com). Roberto: You must also be proud of the Italian Baseball Academy graduates who are now representing Team Italia. Marco Mazzieri: I am proud of all the guys we have right now. We’re proud of Cubs catching prospect Alberto Mineo, Royals prospect Marten Gasparini and all those guys we have there in MLB. I think it’s to the Italian Baseball Academy’s credit with all the work Bill Holmberg is putting into this project that we see results. It’s something we’re proud of, and we hope there are more in the future. Roberto: You also invited Alberto Mineo along with Reds pitching prospect Davide Anselmi to Team Italia Spring Training at Dodgertown in Vero Beach, Florida. Marco Mazzieri: Yes, we did. In fact, Alberto looked very good back at the time in February and now seeing him seven months later he looks even better as you can tell. Roberto: Having seen Alberto when he first reported to Cubs Spring Training Camp in Arizona a couple years ago as compared to how he is today is remarkable. He has matured immensely and his body physique has filled in. The confidence that he exudes now at the plate now is impressive. I know you have worked diligently with him to become the player that he is today. You must be like a proud father to him now. Marco Mazzieri: Well, I think we are all proud of Alberto Mineo and the way he has developed. As you said, he has a tremendous attitude. When he just walks around the field, you see a player. I think this kid has a chance to be really, really good. Roberto: No doubt MLB European scout Bill Holmberg made a great catch for the Chicago Cubs when he signed catcher Alberto Mineo. Marco Mazzieri: It was…I hope that he can get some more playing time in the higher levels. It is not my job to say, but I think he could become a lot better player beyond the Rookie League. Roberto: Earlier in the first round of the competition in Regensburg, Germany, I saw you arrive early at the ballpark to give one-on-one hitting instruction to Alex Liddi in the batting cages. I observed the dynamic between you and Alex, and it was incredible. He listened intently to everything you said and absorbed it in like a sponge. Then he applied what he learned from you an hour later in the game when he was at-bat against Great Britain and hit three consecutive home runs. Marco Mazzieri: We have been working together since he grew up playing professional baseball. It’s long story with Alex actually. Because we have been together since 2005. He moved up from San Remo to Grosseto, where I live. He was not even 16 at the time when started to work with me on his hitting and with Gianni, our strength and conditioning coach, on his physical side. Since then, we’ve been working together almost every winter offseason working on his hitting. He’s been getting good results and that’s why he listens. Roberto: Your current roster is probably 75% Italian-born-and-developed players, right? Marco Mazzieri: Yes, but I think we should all be proud of this group of guys no matter if you have major league guys, rookie league guys or guys who work and play baseball. When they all get together, it’s just one single group. Of course, you have different personalities but they play and lead as a team. And they like it as a team because I think for me and my coaching staff, which I am very proud to be working with such a great group of coaches, one of the biggest accomplishments through all the success we had through the years. But the fact that this group of people have a tremendous energy when they get together. You can tell actually from the WBC to now in the Euro Baseball Championship– win or lose–it’s just a great group of guys. Roberto: The energy and chemistry of the Italian National team combined with the MLB-affiliated players made Team Italia one complete family playing together. One can tell that the future is looking bright for Italian baseball. Marco Mazzieri: Well, we hope so. The team chemistry is really crucial for me and my staff. We believe that a group of individuals going towards the same direction can accomplish a lot more than just talented guys who just play for themselves. It has always been my idea, and when we put a group together we try to make the right decision based on the people first and the players second. Because we believe in the chemistry first with everone in the same direction, we try to channel all energies toward one single goal and luckily we have been able to do that. Roberto: After having spoken to many of the MLB-affiliated players who have played for Team Italia over the years including Jason Grilli, Chris Denorfia, Nick Punto and Drew Butera, they have all cited the experience as being some of the best times of their career. Marco Mazzieri: Well, by you saying this–and I know it’s true because I have talking to the guys–it just gives me goosebumps when you have those kind of players. All those guys are tight with this team. Every time we see them, and we are together they are part of the family. We shared a common energy that we were able to get for the two World Baseball Classics in 2009 and 2013. I happy to know that they cherish those times as much as I do. Roberto: Considering Major League Baseball has injected millions overseas in Asia and Australia, I believe the time is now for MLB to invest in European baseball. Marco Mazzieri: I think you are right. They have invested everywhere in the world, and I think sometimes Europe gets underestimated because baseball is not the number one sport. But as we have seen in the past, you can get good players from everywhere. Just getting back to Bill Holmberg and what he is doing for MLB at the Italian Baseball Academy. I have met many, many coaches in my life and in my career, but I have never seen one with that much dedication and who cares more than he does for his pitchers. Roberto: Team Italia spent Spring Training at Dodgertown in Vero Beach, Florida with hitting coach Mike Piazza. I’m sure everyone missed him during the 2014 Euro Baseball Championship. Marco Mazzieri: We missed Mike. He is a tremendous guy. He is a tremendous hitting coach and former Team Italia player. So we missed him very much and wished he could have made it but he couldn’t. Roberto: How do you react to criticism from the media when they claim that the Team Italia roster includes international players born outside of Italy? 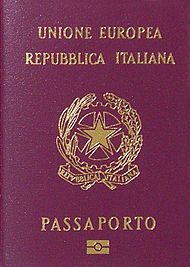 Marco Mazzieri: It’s not the color of the passport that matters, it’s about the passion in the heart. We are on a mission even if we have a younger team. Roberto: Team Italia and European baseball will soon reap the fruits of your labor of love in developing tomorrow’s stars. Thank you! Mike Piazza became the country’s hitting coach. Future Hall of Famer Mike Piazza has been fueling the fire of the Italian baseball revolution for nearly a decade. Since joining Team Italia in the 2006 World Baseball Classic, the proud Italian American has had a profound effect on the growth and development of baseball in Italy. Working in tandem with Italian MLB Academy Director and Team Italia pitching coach Bill Holmberg, Piazza has helped Italy become the superpower of European baseball in light of the recent KC Royals signing of five-tool Italian-born prospect Marten Gasparini for $1.3 million. while Italian MLB Academy Director and Team Italia coach Bill Holmberg (far right) looks on. 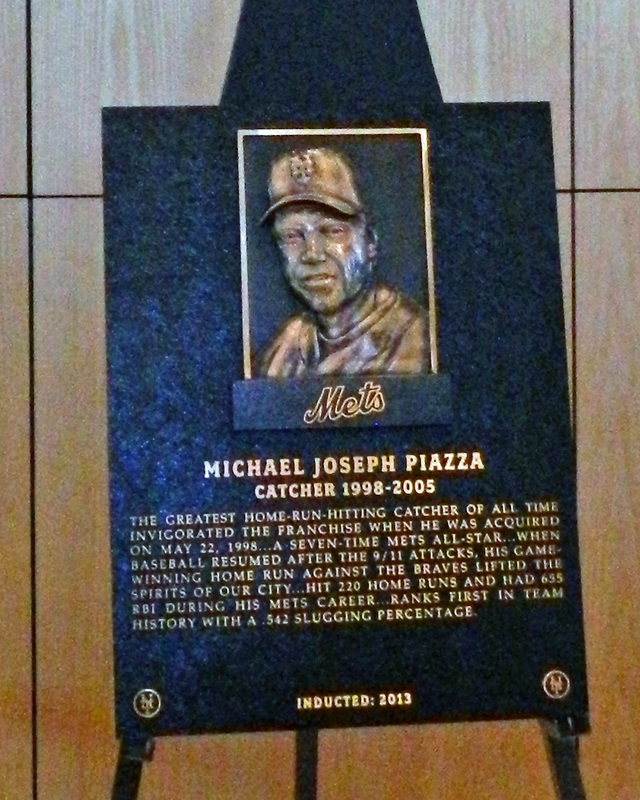 Mike Piazza was inducted into the Mets’ Hall of Fame on September 29, 2013. One statistic often overlooked in validating Mike Piazza’s rightful place in the Baseball Hall of Fame is Career Runs Created by a catcher. Based on the 1,378 Runs Created by Piazza–which ties Hall of Famer Carlton Fisk–Team Italia’s hitting coach was the BEST hitting catcher of all-time (Mike Piazza 1,378; Carlton Fisk 1,378; Ted Simmons 1,283; Yogi Berra 1,265; Joe Torre 1,259; Johnny Bench	1,239; Gary Carter 1,184; Bill Dickey 1,164; Gabby Hartnett 1,161 and Jason Kendall 1,112). Defensively Piazza was the BEST catcher of his time in handling his pitchers. In his career behind the plate, pitchers had a 3.80 ERA when he was catching. Checking the stats for all the other catchers who caught the same pitchers in the same year that Piazza did, they allowed a 4.34 ERA. 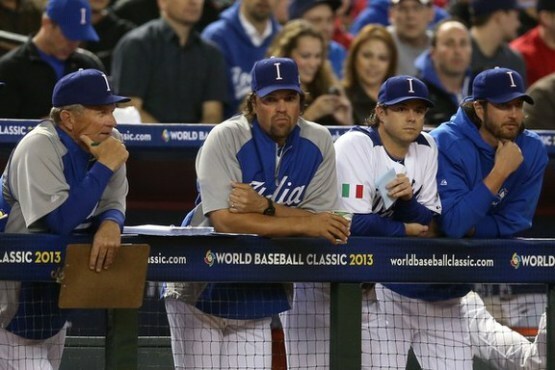 With 12-time MLB All-Star Mike Piazza coaching Italian ballplayers, the BEST has yet to come for Team Italia. Mike Piazza is a baseball immortal regardless of what a pack of bitter, jealous sports writers think. Everyone knows he was The Man. “We just want to continue to draw attention to the fact that we believe baseball is marketable in Italy. We think it’s viable. We think there’s a lot of upward growth. We can produce players over there. I’m convinced of it,” said Piazza. 17-year-old switch-hitting shortstop Marten Gasparini–compared to a young Derek Jeter–and 19-year-old lefthanded-hitting catcher Alberto Mineo lead the charge of the Italian baseball revolution spurred by Dodgers scout/Team Italia manager Marco Mazzieri and coaches Holmberg and Piazza. Grazie di nuovo @FIBSpress! Had an amazing time in Veneto. Great coaches convention. Forza Italia! the 29th Annual Coaches Convention in Veneto, Italy. 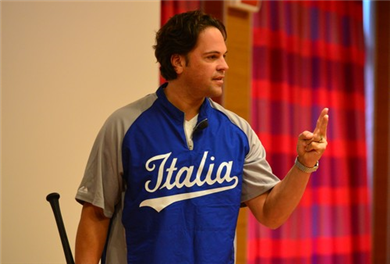 International baseball ambassador Mike Piazza traveled to Veneto, Italy recently to speak to an enthusiastic audience at the 29th Annual Coaches Convention. Piazza said, “We all overteach and overanalyze hitting. Everyone has their own opinion, but in actuality–just as Ted Williams explained in his book The Science of Hitting--the number one rule is to get a good ball to hit. Gaining an understanding of the strike zone and what you can and can’t hit is the key. Simply spoken, you can’t hit what you can’t see.” Twelve years ago in 2002 Piazza met FIBS President Riccardo Fraccari while visiting Italy on a MLB International mission to help the game develop in Europe. Fraccari asked Piazza if he would be interested in representing Italy in international competition, and the proud Italian American responded that it would be privilege to play for the Italian national team in honor of his Sicilian ancestry. During a 2006 World Baseball Classic press conference, Piazza addressed reporters who questioned why he chose to join Team Italia and said, “You may not understand it, but for Italian Americans getting a chance to finally play for Italy is like a duck chick getting close to the water for the first time.” Your browser does not support iframes. 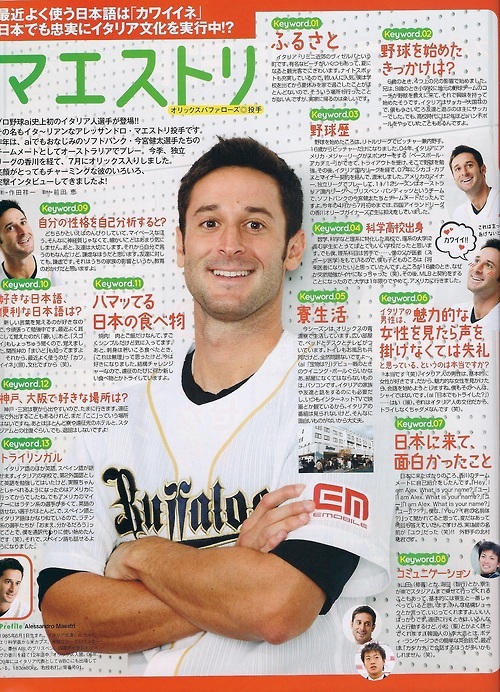 After reaching Double-A ball in the Chicago Cubs organization, Team Italia pitcher Alessandro Maestri ventured abroad and had great success in Australia and Japan. 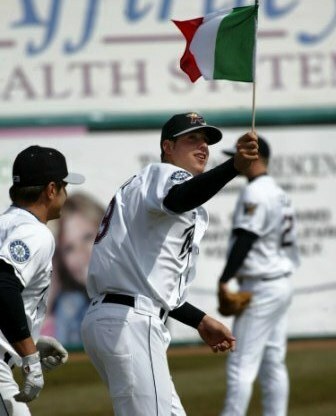 Alex Liddi has carried the Italian flag from the minute he signed with the Mariners in 2005 until now playing for the White Sox. The Italians have since fared well in the World Baseball Classic, nearly upsetting 2013 WBC Champion Dominican Republic and runner-up Puerto Rico. Piazza’s influence swayed Cubs’ slugger Anthony Rizzo to play for Team Italia alongside other MLB Italian Americans including Padres’ Chris Denorfia, A’s Nick Punto, Twins’ Chris Colabello and Pirates’ Jason Grilli. Piazza’s power of persuasion even impacted the Team Italia coaching staff as former MLB journeyman Frank Catalanotto joined the Italian baseball revolution. Team Italia’s homegrown talent held its own and contributed to the overall chemistry of the squad. Alessandro Maestri–the first Italian-born-and-developed pitcher signed by MLB in 2006 and infielder Alex Liddi–the first Italian-born-and-developed player to make his MLB debut in 2011 have benefitted greatly from Piazza’s guidance and mentorship. Piazza has been a proponent of uplifting and preserving his Italian cultural heritage by supporting the efforts of the National Italian American Foundation (NIAF), George Randazzo–founder of the National Italian American Sports Hall of Fame and Roberto Angotti–curator of the Artists’ Tribute to Italian Americans in Baseball Exhibition. 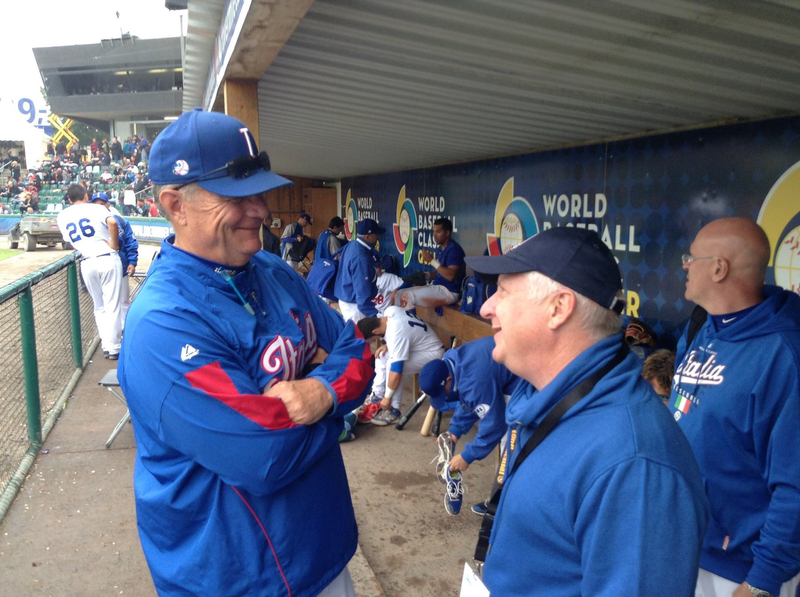 Piazza befriended Angotti during the two weeks Team Italia spent in Phoenix preparing for the 2013 World Baseball Classic. 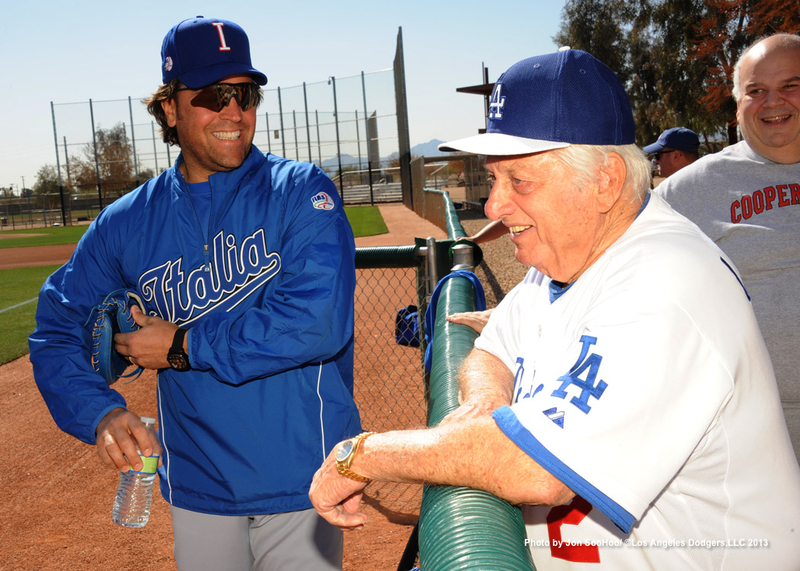 When Hall of Famer Tommy Lasorda dropped in on Team Italia’s practice at Dodgers’ Spring Training Camp in Glendale to address the team, Roberto knew he was on the frontline of the Italian baseball revolution. Lasorda’s emotionally-driven speech coupled with Piazza’s serious commitment inspired Angotti to share the experience with others through a traveling exhibit paying tribute to Italian American baseball.